The first hearings on the Misuse of Drugs (Medicinal Cannabis) Amendment Bill were heard by the health Select Committee in Parliament yesterday. …told MPs on the first day of hearings on the Bill that was not good enough. He said the Bill should be extended to also cover those with severe and debilitating conditions. …has backed the Misuse of Drugs (Medicinal Cannabis) Amendment Bill, but she also identified gaps, saying legal protection for the terminally ill stopped short of what is needed. “That doesn’t address access, it doesn’t address availability, it doesn’t address the quality of the product and it certainly doesn’t address affordability. “We’re all quite aware of the gaping black hole that presently exists”. …said doctors want the best for their patients, but clinical trials and Medsafe approval are needed before medicinal cannabis is made more widely available. …said those most at risk of being prosecuted for illicit cannabis use were not the terminally ill at all. Shane has done a heap of very good work on this issue, and is busy networking with those of possible influence on the Bill. Medical cannabis: Terminal vs Severe and Debilitating? Medical Cannabis Awareness NZ wants the Government’s medical cannabis bill to be expanded to cover people suffering from ‘severe and debilitating’ illness. It currently only allows an exemption from prosecution for using cannabis for people certified to have less than a year to live (but growing is still illegal, as is the supplying of cannabis to them). Terminal vs Severe and Debilitating? The exemptions outlined for the terminally ill by Labour’s Medical Cannabis bill do not go far enough, and have been universally panned by patient advocates and policy experts. “David Clark’s excuse for failing to deliver on Labour’s election promise is that there is a high portion of New Zealanders with chronic pain, many of those however would not be severe such as those who suffer from comparatively mild conditions such as osteoarthritis”. habits directly, before they get to court. “The Solicitor General’s prosecution guidelines could be easily reviewed and updated to include a specific clause in the public interest test section. Such a clause counting against prosecution could be worded along the lines of ‘where the Misuse of Drugs Act has been breached for a significant therapeutic benefit”. “Intervention before prosecution is critical to the safety and wellbeing of patients, most of whom are on benefits who can ill afford costly legal battles, and the seizure of what for many is an essential medicine”. The death of Rose Renton’s son prompted a dramatic change in the direction of her life. Russell Brown explores whether we have got medical cannabis laws right. At the request of his family and doctors, Alex became the first New Zealand patient to be granted ministerial approval to import a non-pharmaceutical grade cannabis product in June 2015. The treatment couldn’t save him, but New Zealand’s conversation about medical cannabis turns on the weeks he spent in hospital, his brain in crisis. In the course of approving the request to import an oil containing cannabidiol (CBD), Associate Health minister Peter Dunne had officials draw up guidelines for future applications, which had been provided for in law for years but never made before. Helen Kelly applied, unsuccessfully, for another cannabis product under those guidelines. Dunne ordered a review and the Labour Party promised to make access easier. This year, Dunne removed the requirement for ministerial approval for CBD products altogether. And now, Alex Renton has landed his mother in court. Rose Renton, who lives in Nelson, is the most high-profile of a series of “green fairies” to face charges of growing, processing and possessing cannabis for supply. Although Kelly very publicly eased her pain with the cannabis products people brought to her door, no one seemed inclined to make any arrests. That has changed this year. That’s a shame. Police discretion could be used if it is not in the public interest to prosecute. Shane Le Brun, who has participated here, has a different approach – to change the medical and legal systems. A few kilometres, almost in line of sight of Rose Renton’s house, Shane and Kat Le Brun are fighting a very different battle — not to reject the system, but to make the system work better. Doctors eventually discovered three of her spinal discs had prolapsed. In the seven years since, the 31 year-old has had spinal surgery and then been re-injured — knocked over by a child in a sandpit — and twice gone into respiratory arrest from opioids administered by emergency medics. Her condition is managed to some extent with methadone, the only opioid prescribed for long-term use. It’s slowly destroying her teeth. Over time, she’s had various powerful opioids, ketamine, gabapentin, valium and an anti-depressant (stress is known to aggravate her condition). She has tried cognitive behavioural therapy and acupuncture. And on one terrible evening in hospital, when she couldn’t stop screaming, she was given an anti-psychotic and shut in a room by herself for the night. But there is one treatment she’s not allowed — or at least, can’t legally get. Cannabis. She says that the first time she tried cannabis (“I got it from a family member”) she slept well for the first time in four or five years. Shane, who now works in IT, had already taken a nerdish interest in her pain medication (to the extent that they suspect he appeared to “know too much” and was incorrectly flagged as a drug-seeker by the system) and turned his attention to cannabis. He formed a charity, Medical Cannabis Awareness NZ, which campaigns for the availability of affordable medicines via the non-pharmaceutical provisions first used by Alex Renton’s doctors. Last year, MCANZ was responsible for 80 per cent of ministerial approvals for their use. Ministry officials who were once suspicious of medical cannabis now speak to him regularly. Ironically, the one he hasn’t been able to help is Kat. “I do find it very difficult,” she says. “It feels at times that he’s fighting harder for others than he is me. At the height of my pain, I have been known to throw a few pillows at Shane and say to him, you’re doing all this work and you have been for so long and I’m still not further ahead. Her frustration is compounded by the stigma Shane’s advocacy attracts. “I have been discriminated against because of what Shane does. I think people hear the world cannabis and freak out — because it’s illegal in their eyes. And all they know of when you say that word is getting high. That’s a real shame, but eventually, hopefully soon, she will benefit from Shane’s efforts. Kat’s own bid to be legally prescribed a cannabis product hit a familiar roadblock — doctors. A senior medic at Burwood spinal unit told them there was insufficient evidence for him to prescribe Sativex, the only Medsafe-approved cannabis product in New Zealand. The ministry has since taken a different view, acknowledging that a cannabis product is a benign option for Kat and approving access. Now, they face the other big roadblock for legitimate medical cannabis in this country: cost. The cost of producing, testing and proving medicinal products is high, especially when there is a very restricted market. Last year, MCANZ helped Auckland MS patient Dr Huhana Hickey win approval for a functionally identical product made by the Canadian company Tilray. But that has ended up being more costly than they’d hoped and the couple are now pinning their own hopes on a similar product made by another Canadian company, CanniMed. Remarkably, the Ministry of Health is now prepared to approve CanniMed’s whole dried cannabis products, for use in vapourisers. It has also tabled work on regulations for growing cannabis locally for research as part of advice to the new Government. Shane believes local production to precise medical standards is the only long-term answer. “The patient population views the green fairies and illegal suppliers as heroes,” he says. “As a charity, we cannot condone or promote illegal activity. But come on — there’s 100,000 people who claim they use cannabis medically at least sometimes and around 50 people in the country accessing it legally at any one time. There’s just a huge disparity. Lawyer Sue Grey has taken another approach. She was a specialist in environmental law when, five years ago, she was asked to act for 61 year-old Golden Bay woman Victoria Davis, who had been charged with cannabis cultivation and possession. Davis had been growing for her husband John, a double amputee wracked with phantom pains. Then, advocating for terminal cancer patient Tom Harris, Grey challenged the Ministry of Health’s position that CBD is a controlled drug under the Misuse of Drugs Act. The Government’s own agency, ESR, wrote in unequivocal support of her argument. CBD officially remains a controlled drug — but when Dunne announced this year that CBD prescriptions would no longer require ministry approval, it was effectively a surrender. But the situation remains vague and confusing. The law, Grey agrees, is a real mess. She says she feels for the police. “I’ve spent a lot of time working with the Nelson police, the drug squad and the prosecutors. When I first started working with them they had zero tolerance for any excuse for medicinal or any other cannabis. Ultimately it’s our MPs, our political parties, and our Government that put the front line police in an invidious position. Dunne tried to progress things on the medical front, but was hampered by an unsympathetic National government. Labour have promised progress, Greens should be a shoe-in for support, but it will still require support from NZ First or national to change out of date and hopelessly impractical laws. But the Minister now responsible for the health side of cannabis, David Clark, could push progress along there. And surely the Minister of Police Stuart Nash could give some direction on the policing side of cannabis, especially where illness is involved. Renton, Le Brun and Grey have done a lot and have achieved a bit, but it’s time for our elected representatives to take responsibility for a messy and stupid situation. If Jacinda Ardern chose to show leadership on this she would be likely to get a lot of popular support. People are suffering necessarily and sadly. There is improved availability of medicinal cannabis oil in New Zealand, with it now being available for GPs to prescribe. It is a cheaper option but could still be prohibitively expensive. The arrival of a new, cheaper medicinal cannabis product in New Zealand is good news for patients but will still be prohibitively expensive for many, advocates say. The cannabis oil, produced by Canadian company Tilray, was first granted an export licence to New Zealand in February, but until now has only been shipped to Middlemore Hospital in Auckland. However, the first shipment that will be made available for GPs to prescribe has now arrived in the country. It contains cannabidiol (CBD) – a cannabinoid that has been shown to have therapeutic properties, but is considered a class B drug under New Zealand law so cannot be advertised or promoted by the company. Medical Cannabis Awareness New Zealand coordinator Shane Le Brun said the product had arrived “in the last week or so”. The often unfairly maligned ex-MP Peter Dunne deserves some credit for this. Trials are underway to test Tilray products’ effectiveness for treating childhood epilepsy, post-traumatic stress disorder and nausea and vomiting in chemotherapy patients. Paediatric doctors here did not want to over-sell the benefits of the oil, “but certainly it does play a role for some of the severe [epilepsy] patients”, Mr Le Brun said. Because it’s one of the few options that offer hope of improvement. But it is still very expensive. The wholesale cost of a single bottle of the oil was about $600 – about half the cost of the only other widely available medicinal cannabis product in New Zealand, Mr Le Brun said. However, he expected the retail mark-up would probably put the price to patients at between $900 and $1000 a bottle. Because Tilray was not a registered medicine, it was ineligible for Pharmac funding. Most parents will not be able to afford that. A much larger evidence base would be needed to get the product registered as a medicine and seek Pharmac subsidies, he said. As well as this commitment they have the legacy of Helen Kelly to honour – Kelly openly talked about using cannabis products to ease her suffering as she died of cancer. The Greens should also support it. They have an agreement with Labour to take cannabis law further, but later – “and have a referendum on legalising the personal use of cannabis at, or by, the 2020 general election”. However Parliament needs a majority. Labour are committed, as are the Greens, but either NZ First or National (unlikely given their past lack of fortitude on medicinal cannabis) to get it passed into law. New Zealand remains reliant to a large extent on progress in research of medicinal cannabis internationally. A major anomaly remains – it is legal to drown your sorrows and self medicate with alcohol, but puffing away your pains is policed and punishable. On Newshub’s 6 o’clock news last night, it was revealed 2 of the larger compassionate supplier’s aka “Green Fairies” are being prosecuted by the police, to the detriment of hundreds (potentially thousands) of patients. “With over 140k people estimated to use Cannabis at least sometimes for medical purposes illicitly, it is no surprise that there are a growing number of compassionate suppliers in both quantity, and scope of their operations”. “With the continued failure at the political level to resolve legal supply of safe sterilized Cannabis based products that a sickness beneficiary can actually afford, these people will be seen as martyrs and heroes to the patient community, and unfortunately it reflects poorly on the police”. “Police Discretion is an empty promise by Politicians to dodge the issue, Police I have dealt with fear setting a precedent by exercising discretion” says MCANZ Coordinator Shane Le Brun. “MCANZ would like to see a political solution far more ambitious and detailed than provided by either of the major parties. We look to Canada as an excellent example to follow, where Cannabis products are so affordable that less than 2% of Medical Cannabis users seek permits to grow their own. “Cannabis-based products are relatively simple, It’s just another Essential Oil. “The Current regime ensures that only expensive products will be vaguely available, and that means patients will continue to break the law, often with the support of their specialists, and making criminals of otherwise law-abiding citizens. “The costs are so high that I am aware of GPs and Specialists that are referring patients to “Green Fairies”. “This is a direct response to increasing acceptance of its medical benefit, and the refusal to accept the cost of Sativex which is borne solely by patients”. MCANZ has avoided the issue of ‘grow your own’ cannabis partly to avoid the stereotypes around the more strident and vocal supporters of MedCan, partly to be seen as the sensible voice on the issue. As a charity it is essential that we have repeat business with medical specialists in order to enable us to best advocate on behalf of patients. For this reason we often find ourselves biting our tongues and generally try not to do anything that would be perceived as too negative or critical of the medical profession. Another part of our advocacy with doctors is our decision to take a stance that is completely against the smoking of cannabis for medicinal purposes. Smoking cannabis doesn’t fit with the Ministry of Health targets for smoke-free New Zealand by 2025, and when there are alternative options such as vaporising or edible products, there is no longer any reason for patients to smoke cannabis. Some western countries have recognised the ability to grow one’s own medicine as a basic human right. Canada in particular went down this path. The Canadian Supreme Court overruled Parliament, to rule in favour of patients rights in this regard. Essentially, patients took the Canadian government to court and won. For this reason the initial Canadian cannabis regime was set up in 2001. Other western countries have followed suit. Some states of Germany are more pragmatic, by allowing patients to grow their own cannabis if they exhaust all routes for accessing funding for the expensive pharmaceutical options available. (In a New Zealand context that would mean, if Pharmac does not subsidise the product then you would have the right to grow.) In South Africa, most recently the entire cannabis law was erased legalizing both medical and recreational use. Again in this case this was recognised as a human rights issue. Unfortunately New Zealanders’ human rights don’t appear to count for much to the current government as displayed by Paula Bennett’s faux pas several weeks ago on the issue of the rights of gang members. There appears to be no accessible mechanism by which to challenge the goverment on the cannabis issue on human rights grounds. For this reason alone, MCANZ has completely detached itself from the debate around making cannabis a human rights issue under the current government. Instead, we have focused on Canada with success in getting reasonably priced Canadian products to our shores and into patients’ hands. From this experience, I would point out that with a good domestic industry, the demand to grow our own would be greatly reduced. In Canada, over 200,000 patients are registered for access, yet less than six and a half thousand have permits to grow. This lack of desire to grow cannabis compared to that existing in New Zealand is directly linked to the ease of access. If licensed cannabis in NZ was stronger AND cheaper than illicit cannabis and already processed into edible forms, then the demand equation would shift quite rapidly and people wouldn’t bother with the extra effort required. The single greatest benefit of ‘grow your own’ to patients is cost. Even with a “near pharmaceutical” regime the cost can still be several hundred dollars a month. If there is no political will to fund even those low costs (Compared to the thousands to tens of thousands of dollars pharmaceutical options cost) then for beneficiaries and ACC claimants the only realistic option is to grow their own. Thousands of patients are already doing this, so this rather controversial law change would merely be decriminalising what is already happening. The most important thing is making patients safe from police interference, as the police treat cultivating a class C drug as a heinous crime meaning charges are immediately laid on arrest. Triple amputees and people who have been battling leukemia for several years have been prosecuted for cultivating. It is the view of MCANZ that this is not in the public interest, and at the very least a legal defence of ‘medical necessity’ needs to be put on the books to ensure police leave patients well enough alone. The main concern raised around a ‘grow your own’ policy appears to be around medical cannabis leaking onto the black market. This is, if anything, a minor harm – more people will be able to access cannabis without dealing with organised crime such as tinny houses et cetera. A sickness beneficiary or an ACC claimant making a little extra cash from surplus cannabis is certainly at the lower end of social harms, however a robust system would have measures in place to prevent such offending by controlling plant quantities. This would not be a free-for-all and there would be penalties for abuse of the system as there are now. The other concern is about control in a clinical setting. Doctors will have to rely on the patients declaring how much they consume if they seek to keep tabs on use. This hasn’t been an issue in Canada where doctors don’t directly prescribe particular cannabis products but effectively grant the patient access with an upper limit on how much they can consume. The patients then order products that meet the requirements of this prescribed amount as they see fit. One of the risks of a ‘grow your own’ system that is not widely known is the risk to property from people growing indoors. We don’t have a major issue with this in New Zealand, however in California there are multiple house fires each week in some regions from indoor grow-ops catching fire. This can be due to a multitude of reasons but primarily people get greedy and install more and larger lights than tents were designed to house (lights can be up to 1000 Watts). All it takes is a single cooling fan to fail while the person is at work and they return to a burnt down house. A simple solution to the safety issue is to have a licensing scheme with annual inspections. If recreational cannabis is to remain illegal then people’s medical grows will be highly desirable and patients will revert to growing indoors for greater security from theft. Safety inspections on an annual basis could keep tabs on how big peoples grows are getting and also mitigate the fire risk by ensuring there are smoke alarms and other safety equipment and perhaps ensuring that there are not too many heat sources such as lights in a small area. 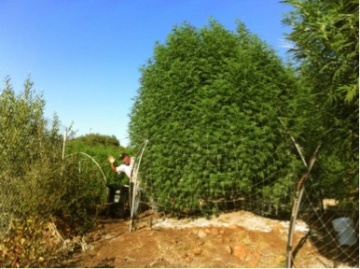 In other countries there are also limits that are placed on the size of a grow patients. Many of these limits aren’t terribly effective, for example in Colorado there is a ninety-nine plant limit. Initial thoughts would be that this is an absurd limit, but it was set with compassionate suppliers in mind. However with the ability to grow massive outdoor plants, these plants limits take on less meaning. A better solution is to institute an area limit, of a certain area per patient (for example 4m2 in flower at any one time). Another issue that must be addressed is product quality for the safety of the patients. In the underground world of “Green Fairies” or compassionate suppliers in New Zealand, the long-term growers, on the whole make very high-quality products. However, there is a new wave of enthusiasts and get rich quick types, some of which are preying on patients by making products that are substandard. There are accusations of people lacing their topicals with DMSO, a potentially dangerous ingredient. In other cases there have been people making butane extracts and not purging or evaporating the butane, leaving dangerous residue in the products for the patients to consume. I have personally met someone who qualifies for the Darwin awards, for cooking Butane Hash Oil in a caravan unventilated. He is permanently disfigured from the resultant explosion. Such risks can be countered with education, some of which is already happening illicitly as cooperatives are beginning to be set up. Generally the illicit market is improving and self-professionalising, lately there has been dramatic improvement in labelling and specification of roughly what ratio of THC/CBD is in the products. As the availability of specially bred medical strains with known cannabinoid ratio’s increases in New Zealand, this standard will no-doubt continue to improve. Despite these negatives, many countries and states of the USA have implemented successful home grow regimes that greatly enhance patient access and reduce the final cost to the patient of medical cannabis. The main issues are around safety of the grow itself and the safety of the finalised products should the patient wish to make concentrates. All of these issues can be mitigated quite substantially through a mix of education and regulation. There is a perk to being late to legalising medical cannabis, we can see what has worked and what hasn’t worked overseas and plan for the unintended consequences that may emerge after law reform. The patients already grow, no amount of cracking down will change that. In the interests of recognising cannabis as a health issue, which even the current government has accepted, the best thing to do would be to design a regime that focuses on nullifying the negative effects encountered overseas, and providing the right knowledge and tools to patients and compassionate suppliers to ensure the products are as clean and safe as can be reasonably expected in a domestic environment. Prohibition has been futile, as is continuing it. So long as the only options on the table legally cost thousands per month for small doses, thousands of patients will opt out of the legal supply chain and grow/make their own cannabis medical products. To have your say on Medical Cannabis go to the Scoop’s HiveMind page and vote on various statements on the issue or submit your own views. Part 1 of this series of opinion pieces covered whether New Zealand really needs ‘Pharmaceutical Grade Cannabis.’ It is available to read here.